Paget’s disease is the second most common bone disease after osteoporosis. Its cause is unknown, but it may be linked with a viral infection early in life. Symptoms are rare. Pain, bone deformities and fractures may be the first signs of the disease. Bone tissue is constantly changing throughout our lives, a process known as remodeling. Healthy bone is broken down (“resorption”) and remade (“formation”). 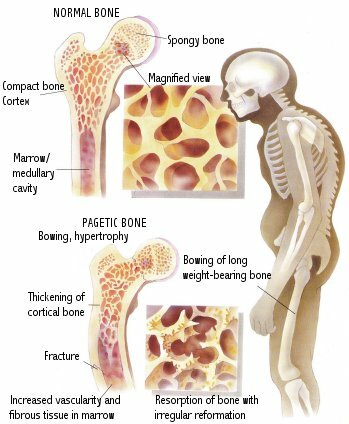 In Paget’s disease, an increase in activity and size of bone cells causes bone tissue to remodel too quickly to be sturdy. Growth may be so uncontrolled that deformities may result. A new group of drugs known as bisphosphonates offers new hope to patients. Paget’s disease may lead to damaged cartilage, osteoarthritis, spinal deformities or enlargement of the skull. The puzzle of Paget’s disease is only now beginning to be solved, although there are still many unanswered questions. Scientists believe there is a causal link with a previous viral infection, suggesting a slow viral process. The disease is often associated with aging. It is known to run in families and occurs most frequently in patients who have relatives afflicted with the disease. It occurs most often in English-speaking countries. Symptoms Are Rare: Most people with Paget’s disease have no symptoms. The disease is usually discovered during routine X-rays or when a bloocl test taken for an unrelated reason shows an abnormal reading for alkaline phosphatase. Alkaline phosphatase is an enzyme found in the blood in a high concentration when bone formation is rapid. The diagnosis can be confirmed by a bone scan, which shows exactly which bones are affected. When people have symptoms, the most common complaint depends on which bones are involved. Bone pain can be present in the face, back or hip joints. Pain is described as vague, not severe, and may be similar to pain resulting from arthritis of the hips, knees and lower back. People with leg bone involvement may notice a bowing of the legs or a change in the way they walk. They may suffer a fracture after a very slight accident. Involvement of the skull may result in headaches, dizziness, ringing in the ears, slurred speech or permanent hearing loss. Paralysis in the lower body can result if the spinal area is affected. Treatment Options: Treatment is usually started only after symptoms appear. A goal of treatment is to prevent fractures and other complications. Medications used include nonsteroidal anti-inflammatory drugs to control pain, especially hip pain. The hormone calcitonin, or a new group of drugs called the bisphosphonates, are usually prescribed. These treatments work by slowing down the rapid bone remodeling that marks the disease. The effect is to help keep bone tissue of normal size and strength. Bone pain is often completely relieved and deformity can actually be reversed with long-term treatment. Calcitonin is a hormone that requires daily injections. Calcitonin, which is expensive, is derived from salmon, pork and human sources. Some patients respond very well to the treatment at first, but after a few weeks of injections, do not continue to show improve. The injection itself can cause flushing, nausea, vomiting and dizziness. Another drawback is the return of rapid bone remodeling when the calcitonin injections are stopped. In some patients, surgery may be an option. Total hip replacement may be needed for severe degenerative joint disease. Bisphosphonates: A new class of drugs increasingly used to treat Paget’s disease is known as the bisphosphonates. They offer patients real hope for long-lasting benefit. Bisphosphonates have the advantage of actually binding to the bone and stopping the rapid bone resorption. This beneficial effect can continue for years after the treatment is stopped. The newest bisphosphonate drugs now in pharmacies have fewer side effects and can be given orally. While not a cure, these drugs provide relief of disease symptoms and prevent progression of the disease. If you have any questions, your physician and pharmacist can discuss the use of these drugs.